New Jersey Gov. Chris Christie, right, and former Dallas Cowboys running back Emmitt Smith on the field before a game between the Indianapolis Colts and Dallas Cowboys on Dec. 21 in Arlington, Texas. The Washington Post’s Chris Cillizza has New Jersey Gov. Chris Christie as the second most likely Republican presidential nominee after Rand Paul. University of Virginia political scientist Larry Sabato lists Christie as one of the top four candidates, along with Paul, Jeb Bush and Scott Walker. And the betting market BetFair had Christie as the fourth most likely as of midmorning Tuesday. These assessments seem much too bullish; Christie has three fundamental problems that are likely to prevent him from becoming the GOP’s candidate. It might be possible to overcome any one of these, but two is very difficult and three is almost impossible. He’s probably too moderate. Last month, I addressed Bush’s candidacy and sought to evaluate whether Bush is too moderate to become the nominee. It’s a close call. Bush is not that much more moderate than Mitt Romney or John McCain, the past two Republican nominees. But the party has become more conservative since 2008, and it has a deep field of potential 2016 candidates. Republicans can afford to be picky. 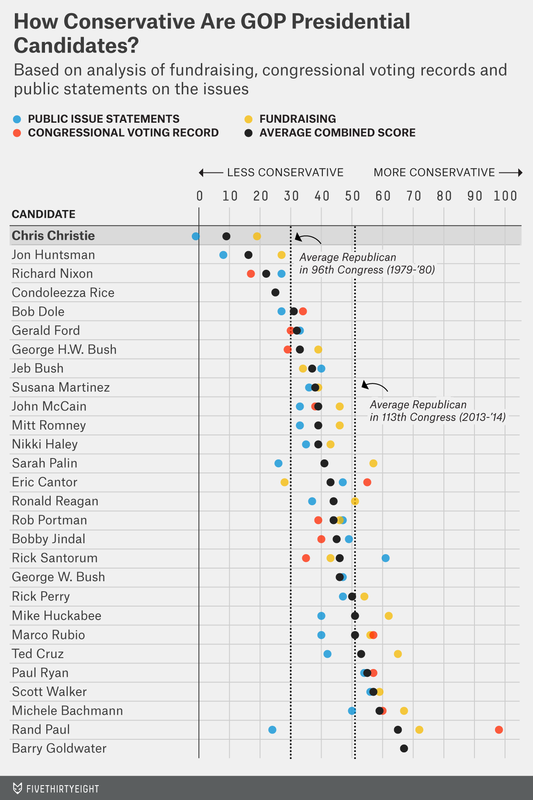 So far, Bush’s candidacy has not been received that well by influential Republicans. 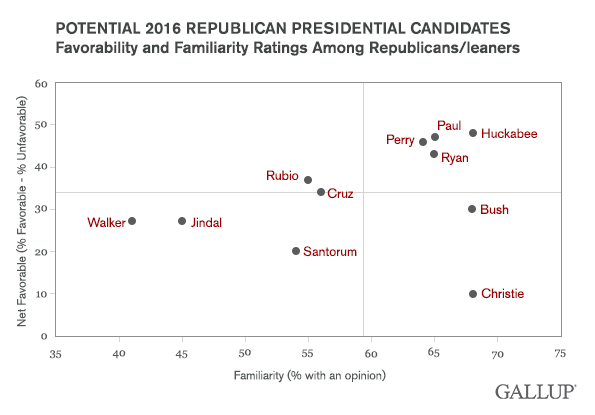 Christie, however, ranks to the left of Bush by the statistical systems that measure candidate ideology. Indeed, Christie takes moderate positions on the very issues where Bush notoriously deviates from the party base — such as immigration and education — along with others where Bush lands in the GOP mainstream, like on gun control. (Christie has a C grade from the National Rifle Association.) Any voter who opposes Bush for ideological reasons probably won’t find a lot to like in Christie either. He probably lacks the discipline to win the “invisible primary.” The candidates who survive the early stage of the invisible primary tend to be those who avoid making news when they don’t need to. Donors and other influential Republicans won’t want to nominate a candidate who will risk blowing a general election because of a gaffe or scandal that hits at the wrong time. So, what to make of something like Christie having been spotted in a luxury box in Arlington, Texas, on Sunday, where he joined Dallas Cowboys owner Jerry Jones ­­to watch the Cowboys’ 24-20 comeback win over the Detroit Lions? (Unlike certain politicians, Christie doesn’t seem to have mastered the art of rooting for a team from a swing state.) It seemed like a silly controversy until it was revealed that a company co-owned by the Cowboys was recently awarded a contract by the Port Authority of New York and New Jersey. Whether there’s actual impropriety or just the appearance of it, it was a dumb place for Christie to be seen if he’s contemplating a presidential bid. A presidential campaign is a long and mostly dull thing, and reporters chase down the serious and silly stories alike. Christie’s transgressions against Republican orthodoxy and tendency to make the wrong kind of news can amplify one another. If Christie were seen as a staunch conservative, Republicans might be more inclined to rally around him and critique the “liberal media” for persecuting him. But Christie has not always been a team player for the GOP. His speech at the 2012 Republican National Convention seemed to go out of its way to avoid praising Romney. And Christie’s embrace of President Obama as the two toured seaside communities hit hard by Hurricane Sandy in 2012 also rankled many in the GOP. Republicans voters just aren’t that keen on Christie anymore (and they’re plenty familiar with him; he’s one of the most well-known Republicans). A Gallup survey in July found Christie with the lowest net favorability rating with GOP voters among the 11 Republicans that it tested. He no longer has a good “electability” case. The decline in Christie’s favorability has also translated into his overall numbers. In late 2012, his favorability rating was 45 percent nationally against just a 20 percent unfavorable rating, according to Huffington Post Pollster. But Christie’s popularity has waned considerably in the wake of “Bridgegate” and other controversies. Now his ratings have turned negative; he has a 33 percent favorable rating and a 43 percent unfavorable rating, according to HuffPost Pollster. His head-to-head numbers against Hillary Clinton are no longer any better than those of fellow Republicans Bush and Mike Huckabee. This isn’t catastrophic unto itself. There are lots of unpopular politicians in both parties. The head-to-head numbers don’t mean much yet, and many Republican voters would come around to Christie were he to win the nomination. But Christie’s case to Republicans is especially dependent on his perceived ability to win the general election. That’s the reward the GOP would get for putting up with the baggage Christie carries. Without it, it’s hard to see the Republicans’ rationale for choosing him.